Slums in other US-tied Domains Remain Forgotten. Post-Maria conditions in Puerto Rico have exposed the shameful benign neglect that the U.S. government has long showered on its most visible territory. Unfortunately that exploitation and disregard extend even to “independent” nations tied to the U.S. apron, as exemplified by Ebeye in the Marshall Islands. San Juan, Puerto Rico – Since Hurricane Maria devastated the island of Puerto Rico, the U.S. territory – which rarely garners much attention from the national media – has received widespread coverage which has focused on the Trump administration’s slow response to the disaster. The situation in Puerto Rico is undoubtedly dire, as many struggle without power and access to basic necessities more than a week after the storm struck. In addition, the Trump administration’s response has been notably lackluster in several regards, which has brought renewed scrutiny to its attitudes and performance. Once a pristine and sparsely populated sandbar island, Ebeye is now one of the most densely populated places in the world with over 15,000 residents crammed into less than 80 acres of land (31 hectares). Many of its residents are refugees from other islands throughout the Marshall Islands — islands that were rendered uninhabitable or completely destroyed by the U.S. government’s tests of 67 atomic bombs over a twelve year period, following its seizure of the territory from the Japanese after World War II. Some of those islands have since been cleared by the federal government as “safe” to inhabit. However, local leaders remain skeptical that this is the case, given that the government made such assurances to the Marshallese before, only to have the inhabitants unwittingly become part of a massive human experiment on the effects of environmental radiation exposure over time. In the meantime, the displaced make their living in “a shameful slum,” as Ebeye was once called by author and journalist Simon Winchester. Since assuming control of the island in 1944, the U.S. government was taskedwith administering the governing body of the Marshall Islands, of which Ebeye is part. Though the Marshall Islands ostensibly gained “independence” in 1986, since 1983 its sovereignty has been dictated by a “Compact of Free Association,”, which did little to change its status. Per this compact, the Marshall Islands leased most of its land to the U.S. military for bases and other installations in exchange for U.S. economic assistance to the islands. Lurking below these technicalities and legalities is the reality that Ebeye has essentially been rented to its populace by the U.S., primarily to serve the needs of the U.S. military and its base on neighboring Kwajalein. Independence means little without the resources or wherewithal to provide for the needs of one’s people. Ebeye’s sewer system has not worked for nearly four decades — it did not work prior to “independence,” and it has not worked subsequent to “independence.” As a result, raw sewage often pools in the streets while human waste is often pumped into a lagoon near where children swim. Lesions and sores on islanders are common, as are periodic outbreaks of cholera and dengue fever. Clean drinking water has to be brought in by ferry from nearby islands. The only health center on the island struggles with insect infestations. The nearest hospital, located on a different island, does not include any oncologists despite the fact that cancer is rampant as a result of radiation exposure. Indeed, there is not a single oncologist in all of the Marshall Islands. Ebeye – even though a large portion of its population is under the age of 18 – has no functional schools and no parks. It is also exceedingly overcrowded. The shacks that line its streets can house up to 40 people, often extended family members, who take shifts sleeping due to the lack of space. Almost a decade ago, the island ran out of space to bury its dead, forcing grieving families to place coffins on top of existing graves. Numerous housing units essentially share space with the island’s open-air garbage dump. The lack of space has also made it impossible for the island to grow its own food, forcing islanders to eat imported junk food – like Spam and Cheetos – because that’s all that is available. As a result, the adult population has the highest rate of diabetes in the world, obesity is rampant, and children often fail to grow to their normal size due to malnutrition. Most of Ebeye’s population is unemployed, making poverty not only common but often inescapable. The local economy is dependent largely on the U.S. military base just 3 miles away, a base that boasts all of the amenities of modern living in a resplendent microcosm of American suburbia. About 1,000 Ebeye residents are ferried there on a daily basis to serve the American soldiers, military contractors, and their families. They make $10 to $12 an hour, significantly more than the Marshall Islands’ minimum wage of just $2 an hour. The military base — part of the Ronald Reagan Ballistic Missile Defense Test Site, on the nearby island of Kwajalein — is world’s apart from Ebeye, despite their geographical proximity. The island is over 3,000 acres in area, nearly 40 times larger than Ebeye, yet houses just 1,300 Americans who work for the U.S. military, along with their families. The Americans live a “wonderfully luxurious country-club existence” where they are “utterly segregated” from the native islanders. The base boasts a golf course, movie theaters, a country club, a bowling alley, a skate park and a yacht club, among other amenities. It also has an elementary and junior/senior high school, a childhood development center, and adult enrichment programs. Marshallese, however, are not permitted to live on the island, including those who lived there prior to the base’s construction; nor are they permitted to freely visit or enjoy any of the amenities offered at the base. The base is accessible only to the handful of Marshallese who work there and only for work-related purposes. Only a small fenced-in area near the dock, complete with barbed wire and security guards, is open to the Marshallese. It holds the only laundromat available to residents of Ebeye, as well as an “American eatery” that serves fried chicken and mashed potatoes. Occasionally, islanders are permitted entry to the Ebeye hospital, which is not located on Ebeye but rather on Kwajalein. However, the hospital caters to the American population and the services it offers to the Marshallese are minimal. As one Ebeye resident told journalist John Pilger “They don’t treat them [the Marshallese] with medicine. They just go there for taking the blood and then X-rays.” When someone on Ebeye is seriously ill, the hospital is “unable” to help them. If that weren’t enough, the base itself poses a threat to Ebeye. 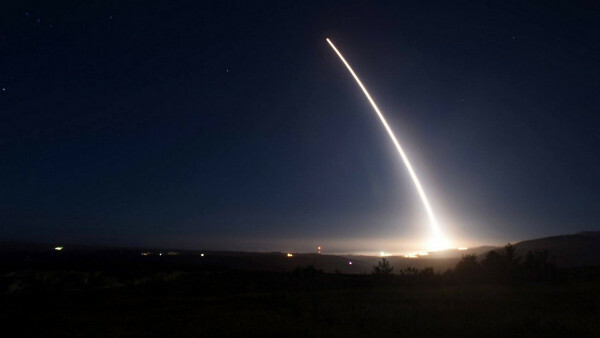 Several times a year, missiles are fired from military bases in California and Alaska towards the Kwajalein Atoll, which includes Ebeye – tests that some have called a “a multi-million-dollar game of darts,” as the nuclear-capable missiles have been known to occasionally veer off course. Every missile fired on the Marshall Islands and from the Kwajalein military base costs at least $100 million. Meanwhile, Ebeye lacks even the most basic necessities. The U.S. government is well aware of Ebeye’s troubles. In the 1970s, the Army surveyed Ebeye, finding that the sewers, water and electrical systems were nonfunctional. Nothing was done. Then, in 2010, the U.S. Army was warned that Ebeye’s lack of infrastructure was a major health risk to its residents. That advice, however, was ignored for six years until the U.S. government announced that it and Australia would spend $50 million on restoring the island’s nonfunctional sewage and water systems. Though the project has yet to make real progress, it is supposedly set to end what the U.S. government refers to a period of “benign neglect” that has resulted in Ebeye’s woes. Everyday Puerto Ricans, themselves victims of U.S. neo-colonialism, now find themselves – in the aftermath of Hurricane Maria – living in conditions comparable to those the Marshallese on Ebeye have endured for decades. Puerto Rico will likely receive increased aid, spurred by harsh media criticism of the Trump administration’s handling of the matter, and will eventually be able to rebuild. Yet Ebeye continues to languish in the shadow of the Kwajalein military base, as its people remain voiceless and without recourse. Terrific report! I knew most of this from years of living in Hawai’i and getting to know the late Darlene Keju, a Marshallese woman and her Caucasian husband. Darlene got her Masters in public health from the University of Hawai’i, then returned to educate and train her Marshallese compatriots. She was beloved by her people because of this, and she gave a moving address to the World Council of Churches, the video of which can still be found (I think) by putting her name into a search engine. She died at 46 from the cancer caused by the atomic testing when she was a baby. Her husband, Giff Johnson, wrote a loving book in memorial to her called “Don’t Ever Whisper,” which was Darlene’s advice to a shy Marshallese girl about public speaking. An interview with Giff can be seen in Regis Tremblay’s excellent film, “Thirty Second to Midnight,” completed this year.